The List View is a powerful tool for viewing the contents of a Package or a diagram as a list of elements, allowing the elements' properties to be viewed and edited in a convenient spreadsheet-like view. Many analysts will prefer to view elements in a list, and when details are changed the changes will be effective in every other view of the element, including diagrams and the Project Browser. There are a number of options for filtering, sorting and grouping elements in the list based on a wide range of properties and Tagged Values. The List View can be used to get a different view of the elements contained in a Package or a diagram and to visualize their properties in a single spreadsheet-like view. It is particularly useful when dealing with non technical audiences or when the elements need to be sorted, filtered or grouped based on criteria such as Name, Status, Phase, Version and more. 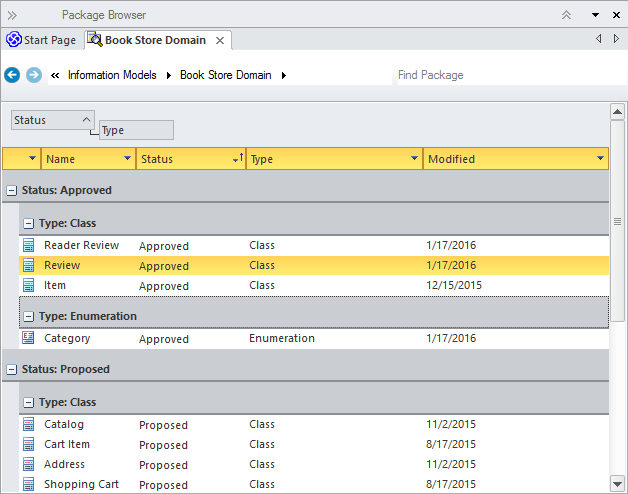 Project Managers and others working with sets of elements will be able to analyze in a given Package or diagram. 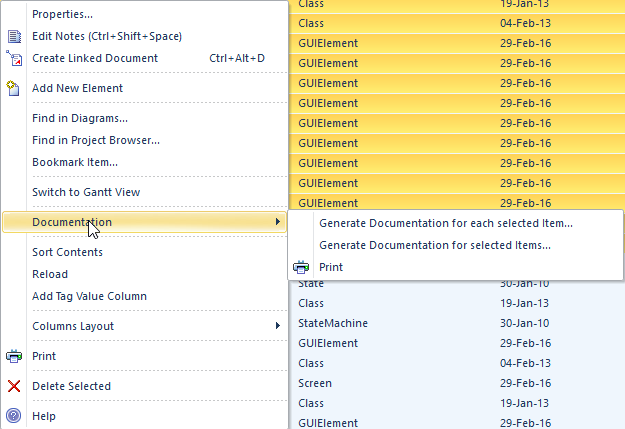 There is also a related Gantt View where resource allocations, work completion and timings can be visualized. Additional properties can be added by using the 'Field Chooser' dialog and Tagged Value columns can also be added, allowing a modeler to view the elements' native properties and Tagged Values side-by-side. The elements in the list can also be exported to a document report using any number of built-in or user defined templates and generating to a variety of formats including Docx, PDF and RTF.